Sometimes, you may download funny and interesting flash videos from internet, and then there are times that you wanna watch them on mobiles indeed. But unfortunately, you cannot do so directly since the flash video is formatted in SWF usually. Only you convert SWF to MP4, can you enjoy your interesting flash video on iPhone, iPad, Android, Samsung, HTC, LG, PSP, etc. SWF is an Adobe Flash file format used to run animated vector graphics directly in a Web browser. For a long time and as of the moment, short and funny SWF animated flash files have taken over the internet. However, the emergence of new media tech and playback platform means that, in spite of its popularity in displaying animations and video clips on the web, this type of format is rarely served up by common video media players, nor can it be played on any portable devices. Given the incompatibility issues the SWF format can bring, users now turn to change SWF to another file format that can be more accessible by using any media player and new mobile playback platforms available without the need of any added ware or plug-in. Here MP4 is the one that taking over its place. As you know by now, it is inevitably necessary to convert SWF to MP4 Mac/Windows. 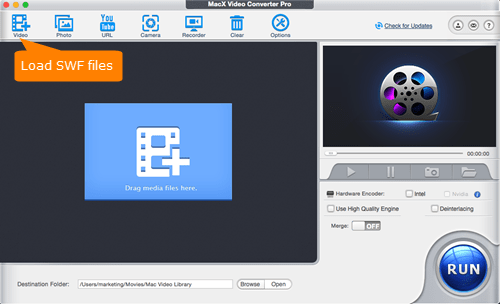 In order to preserve high quality after SWF to MP4 conversion, here a great video format transcoder named MacX Video Converter Pro is available for you. It's specifically designed to decode SWF video to MP4 on Mac or other formats like MKV to AVI, AVI to MP4, WMV to MOV, MKV to MP4, AVCHD to MOV etc with unique styles and high video quality. With the built-in multi-core CPU, hyper-threading and Intel QSV/Nvidia/AMD hardware acceleration tech, the video conversion can be done within a very short time (30 sec for a 3-5 min music video) with 98% quality reserved. Why Change Video from SWF to MP4? MP4 may be the most widely used video format as this format joins in Android supported format list, iPhone supported format list, Kindle Fire supported video formats etc. In fact, this video format provides videos with high video quality and greater degree of compression which can be delivered everywhere - from mobile phones and tablets to desktop computers. If you are dealing with SWF file formats, you must understand the importance of converting SWF to MP4 format. Many users may wonder if they are making any sacrifices in quality if they convert SWF into MP4. They can rest assured of that as MP4 is famous for providing high quality video that are no less than SWF. Limits on the SWF format as regards to the media players that support it are now removed. 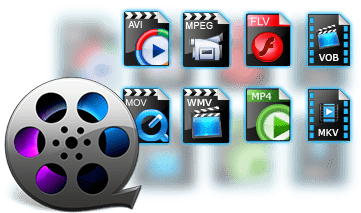 Many media players as well as various kinds of mobile devices such as iPad, iPhone, Samsung, Android etc are now listing MP4 as their preferred file format. If you have local or self-made SWF videos planned to upload online, converting SWF to MP4 will definitely survive you from the failure of straight SWF uploading to YouTube, Facebook, Vevo, Instagram, Myspace, Dailymotion etc. How to Transcode SWF Video to MP4? After free downloading this top video processing app, fire it up on your macOS. Click "Add File" button to add the SWF files. If you are running on a Windows PC, you can download the Windows version . You can choose different formats for different files thereon. Here we choose MP4 as output format from the format list. You can also change audio and video parameters as you wish. Tips: This best video converter for Mac also allows you to convert SWF directly to various mobile devices, such as iPad Pro/mini, iPod, iPhone, Samsung Galaxy Tab S, Sony Xperia, Android HTC One etc. Specify output folder on your computer to save the output files. Click the "Browse" button to select a folder where you want to place your output MP4 files. After finish the above steps, click the "RUN" button to start conversion, you could view the conversion progress and are able to cancel the process at anytime. 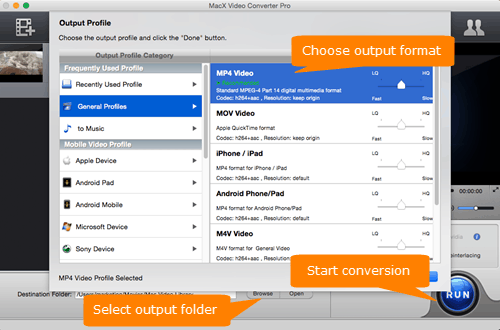 Tips: With MacX Video Converter Pro, you are also allowed to convert among lots of various popular formats, like SD videos MOV, FLV, WMV, AVI, F4V, RMVB, MPEG etc and HD videos MKV, M2TS, MTS, TS, AVCHD etc including AVCHD to MP4, MKV to H264, MTS to AVI, FLV to MOV and more with super high quality. Step 1: Upload SWF files. Select files from Computer, Google Drive, Dropbox, URL or by dragging it on the page.